Leftist 'documentaries' have tried to portray the IDF as 'inhumane' for years. A new film presents 'guilt' from 1967 war of survival. Leftist Israeli filmmakers are known for negatively portraying IDF soldiers, as recently exemplified by "5 Broken Cameras," but a new documentary is seeking to push the envelope and go back in time to the 1967 Six Day War. The film, "Censored Voices," premiered at the Sundance Film Festival on Saturday, reports the New York Times. It takes snippets from interviews conducted after the war with soldiers from Israel's socialist kibbutz movement, using them in an apparent attempt to portray the IDF as immoral, even though the war has always been in the Israeli consensus as a justified and miraculous victory. Even the Times recognizes the slant of the film, calling it "the latest in a series of movies by leftist Israeli filmmakers who have won awards abroad by presenting harsh looks at their own society." Director Mor Loushy (32), who created the movie, was quoted as saying that her motivation was to change the perception of the 1967 war as a victory - a perception that exists given the remarkable nature in which the nascent modern Jewish state, faced with near-certain destruction, recorded a stunning victory over numerous professional armies on all fronts in less than a week. Her film has been criticized for removing that context from the war, even as it briefly presents the threats facing Israel. "People abroad who don't remember the circumstances of the Six Day War the way we do will turn this into one more indictment of Israel," said Yossi Klein Halevi, author of the book "Like Dreamers" from 2013, which traces the lives of veterans of the war. 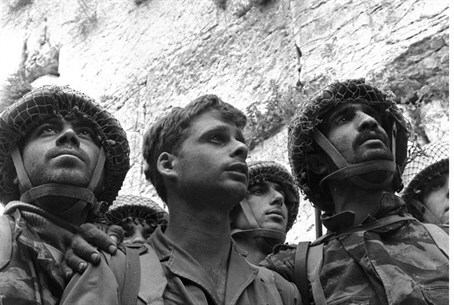 "If there were isolated acts of abuse by our soldiers, that should not become the narrative about what the Six Day War was about," Halevi told the Times. "Many of us here are, frankly, sick and tired of the blame-Israel-first narrative." In fact, this is not the first time Loushy has criticized Israel via the medium of film, having worked most recently on "Israel Ltd.," which negatively portrays "Zionist propaganda tours." The film runs 84 minutes and had a budget of just under $1 million, provided by Israeli and European broadcasters as well as Impact Partners, an American documentary producer. Framing the liberation of Israel's Biblical heartland as "conquest," Loushy said: "This is the story of men who went out to war feeling like they had to defend their life, and they were right, of course, but they went out in one position and came back as conquerors." She got the idea for the film while researching a history paper, during which she read Avraham Shapira's "A Conversation With Warriors," entitled "The Seventh Day" in the English-language version. She then convinced Shapira, who also is a member of the socialist kibbutz movement, to give her original audiotaped interviews. Shapira claimed the kibbutz soldiers featured in the film "anticipated what can happen if we'll not work immediately for peace, practically to return back all the occupied territories." In the film, as described by the Times, the aging kibbutz movement IDF soldiers sit next to Shapira's original tape recorder and listen to their interviews, in which statements are heard such as "the brigade commander said to kill as many as possible." Regarding Arab residents on rooftops, a location from which the IDF often came under sniper fire, one soldier is heard saying "they're civilians - should I kill them or not? i didn't even think about it. Just kill!" Another claims, "in the war we all became murderers." Yet another recording has a kibbutz soldier saying the "Arabs' hatred towards us will be much more serious" in the next round, apparently blaming the war for survival of "not solv(ing) the state's problems." At the very end of the film, in its final minutes, several of the now elderly soldiers speak, with one saying he has become "less Zionist, less patriotic, less of a believer." However, another says "I'm much more right wing than before." One soldier, Pinchas Leviatan (73), admits, "I was convinced that the peace is coming, and maybe after the Six Day War I was hoping that it's going to happen. I was very naive." "I participated in another five wars as a commanding officer. The fact is that during the years, I lost my belief in the possibility of getting any solution in the area," added Leviatan. IDF Spokesperson Unit's Lt. Col. Peter Lerner was asked by the American paper to respond to the film, and said it shows Israel's "vibrant democracy, where everything can be and is openly discussed." At the same time, he stressed that today's circumstances are completely different, in that Israel does not face sovereign armies but rather terrorists "dispersed within the civilian arena." "Any attempt to draw similarities between the two is weak and nonrepresentative of how warfare has developed, how the battlefield has evolved and how today, terrorism takes precedence over traditional warfare," said Lerner.